Again from the "Bonus Features" menu, select "Mr. Ray's Encyclopedia" then move down to the return to previous screen arrow and press your Down button one more time to highlight another fish to the left of the play all option and press your Enter button. Highlight and enter Special Features. Highlight Studio Tours and push UP on directional button. This will show an invisible fish. Highlight and enter the fish for a quicky video. Disc 1: Go to the "Setup" screen then highlight the subtitles option and then press your Left button on your remote to highlight a fish icon. Then press your Enter button the hear the egg. Disc 2: Go to "Bonus Features" menu and highlight the return arrow to the previous menu, and then press your Down button. In the upper right hand corner, a little green fish will light up and pressing enter will bring up a 'commercial' for the Aqua Scum 2K3 Laser Fish tank cleaner. On disk one go to bonus features, highlight the arrow at bottom of screen then press down, a green egg will pop, up press enter or play, a short egg with dory and marlin will play. Go to bonus features, then visual comentary, while on the fish that looks like its in the tv press up, a green fish will appear press play or enter a short egg with Dory and Bruce will play. 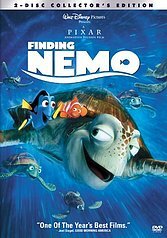 On Finding Nemo Disc 1, select Bonus Features. Highlight the fish in the TV on the lower left. Press the left arrow and a new fish will appear on the right side of the screen. Hit enter and you will hear Bruce�s oath. Go to the set-up menu. or hit the #6 on your controller. Go to bonus features. Go to Virtual Commentary Includes deleted Scenes. Next go to Virtual Commentary Index. High light Play All and press the left button. A fish will appear click on the fish and you will hear a quick speech from Bruce. On disc 2, select the 'Bonus Material' option, on that menu, select 'Behind the Scenes', then move to the return arrow, and push right. The will highlight a fish, select for another small scene.